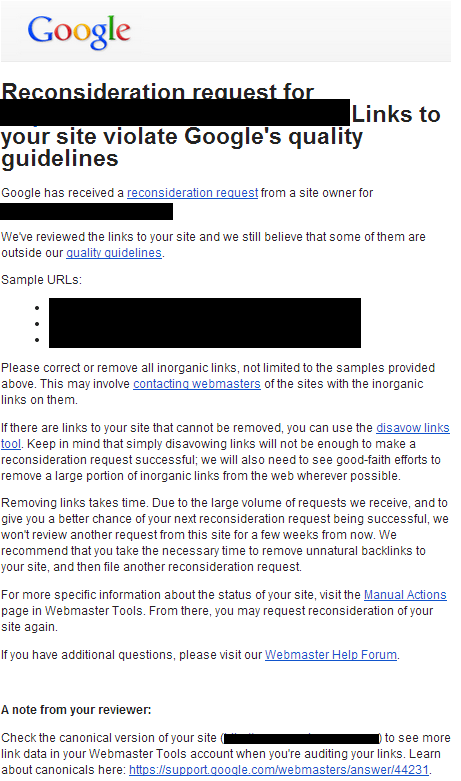 Last week, we reported that Google is improving their reconsideration request rejections with more feedback. Well, now I have a picture of a reconsideration request submitted to one of our readers back on Friday. The new reconsideration request rejection notice has a note on the bottom of the templated rejection notice that reads, "A note from your reviewer." Then it goes on to show a hand written note from the Googler who responded to this specific reconsideration request. Check the canonical version of your site to see more link data in your Webmaster Tools account when you're auditing your links. Learn more about canonicals here: https://support.google.com/webmasters/answer/44231. So we have a Googler here saying you still have many bad links to your site and we know you are looking at the wrong data. To get to the right data, you need to visit Webmaster Tools reports for the canonical URL where these links are pointing. That advice is golden, and most SEOs and Webmasters wouldn't think to look there.